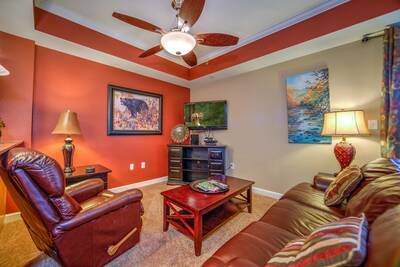 Welcome to Holiday Chalet in Pigeon Forge! 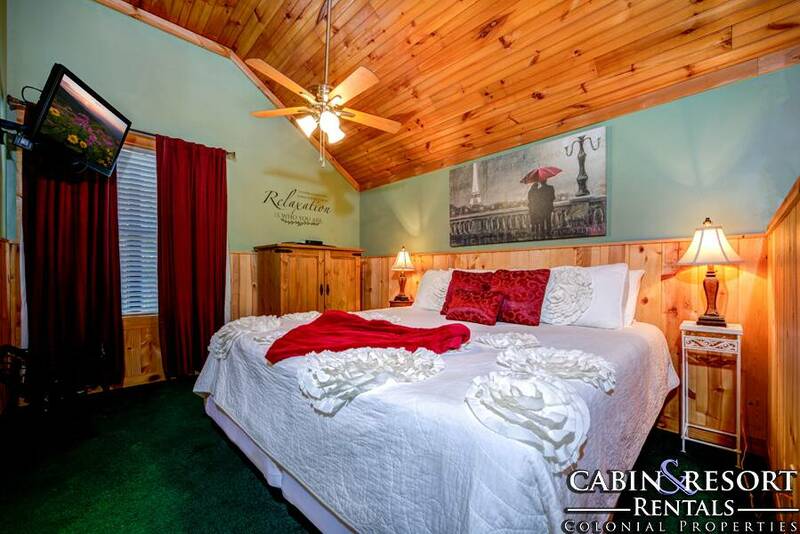 This 1 bedroom, 1.5 bath Smoky Mountain cabin rental is a beautiful and romantic place to spend some much needed away time with your sweetheart. 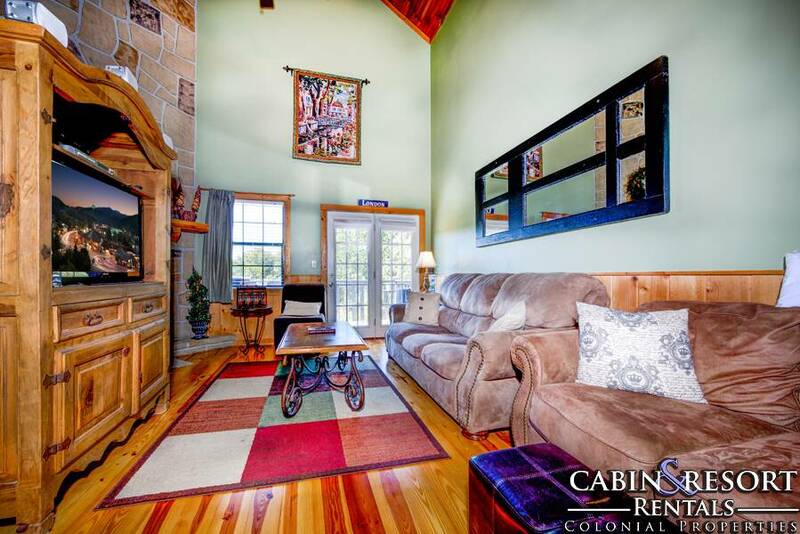 This charming vacation getaway is the perfect spot for your "holiday" in the mountains. With a super convenient location near downtown Pigeon Forge, Dollywood, The Island, The Old Mill and numerous attraction, dining, shopping and entertainment options, you and your special guest will spend less time driving and more time having fun with one another. The amazing living room features a floor to ceiling stone accented wood burning fireplace, flat screen TV, comfy furnishings and decor and a gleaming natural wood cathedral ceiling overhead. Located just off the living room is a half bath for additional convenience. Just off of the living area is the fully equipped kitchen. Here you and your companion can prepare each other breakfast in bed, a tasty lunch or a romantic candlelight dinner for two. There's also a nearby dining table that seats up to four people comfortably. 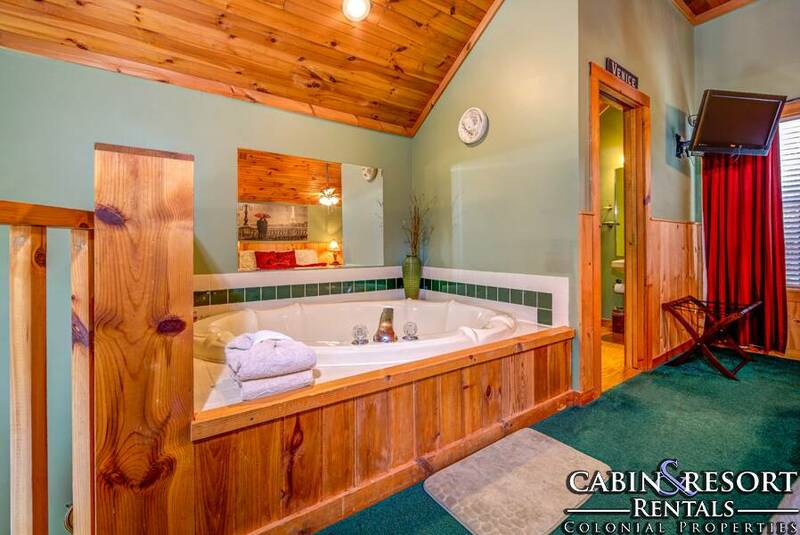 Head upstairs and you’ll enjoy the truly romantic and restful master suite. It features a luxurious Tempur-Pedic king size bed, soothing bedside jetted tub, flat screen TV and a private in-suite full bath with separate shower for added privacy. 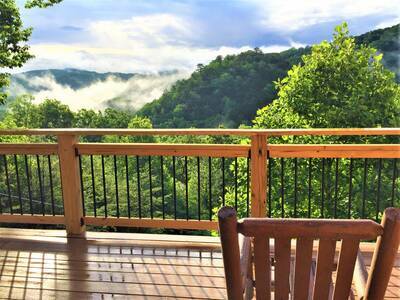 Step outside on the main level deck and be amazed by the sweeping Smoky Mountain view as far as the eye can see. Take a dip in the bubbling hot tub and enjoy the breathtaking view or for a super romantic experience, relax in it at night while gazing at the twinkling stars above. 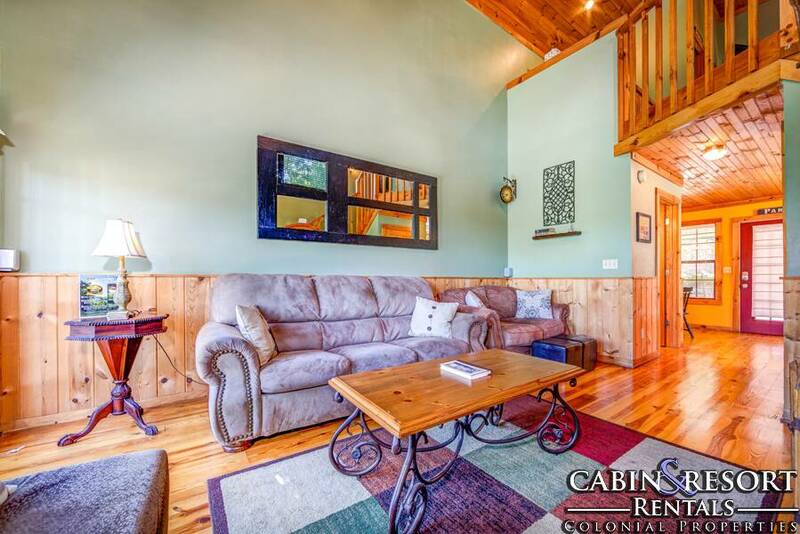 Holiday Chalet also features a peaceful covered front porch with rocking chairs for even more outdoor enjoyment. 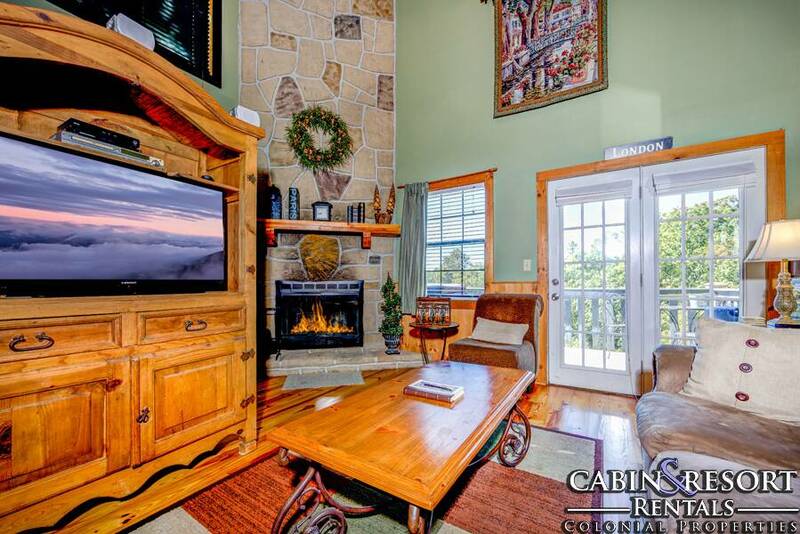 This wonderful Pigeon Forge getaway offers complimentary high speed wifi internet - make sure to pack along your computer, tablet or smart device so that you can browse the web or check your email while on vacation. 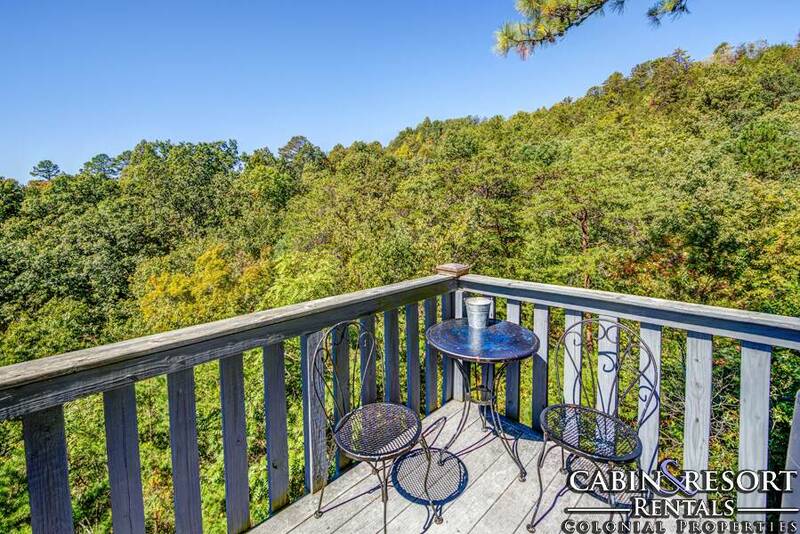 With its fantastic location, beautiful decor and mountain views, your stay at this Pigeon Forge cabin rental getaway is sure to be something you and your sweetheart forever cherish. 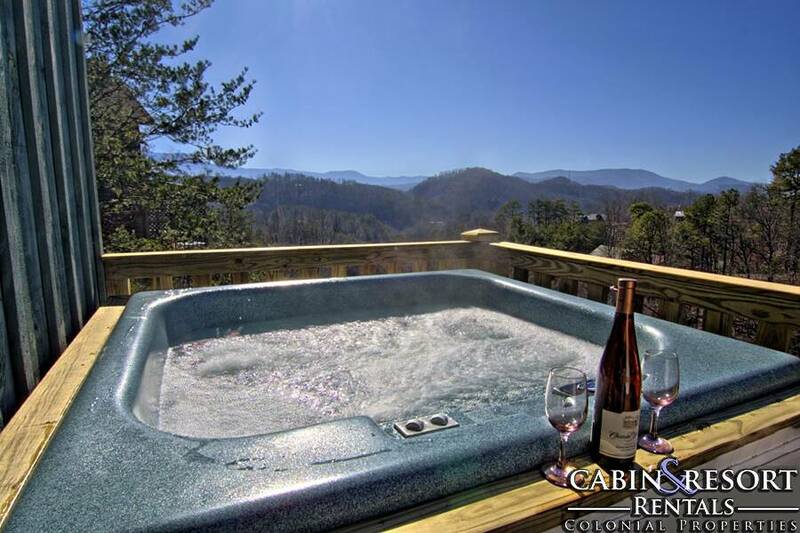 Plan your romantic holiday in the Smoky Mountains today at Holiday Chalet! A: Yes, all Hot Tubs have covers, to hold the heat in when not in use. A: Hi Lesia! 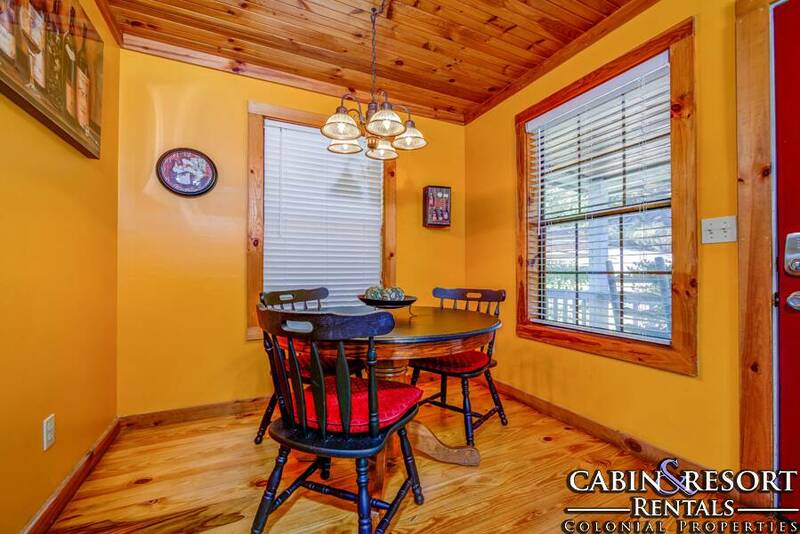 Holiday Chalet is located approximately 10-15 minutes to the Island in Pigeon Forge. A: Yes, this property is equipped with WiFi. “ The cabin was amazing. I honestly have no complaints. I would definitely go back! “ We stayed here for our 6 year anniversary. What a wonderful time we had here. Sitting in the hot tub at night looking at the stars and out at the mountains was magical. We had some small issues when we first arrived and questions about the hot tub, which they were very quick to resolve and answer our questions and the rest of our trip was a dream. Already booking a cabin with them again for the month of October for our family's October birthday trip. “ Everything from making reservations to check out was made super easy! Any time I called, staff were extremely helpful and FRIENDLY. My husband and I recently celebrated our 10 year anniversary and we wanted a long weekend get away. Holiday Chalet met all of our expectations. The view was amazing! We are already talking about our next trip! And a tip to fellow antique hunters, there are some AWESOME antique stores!! 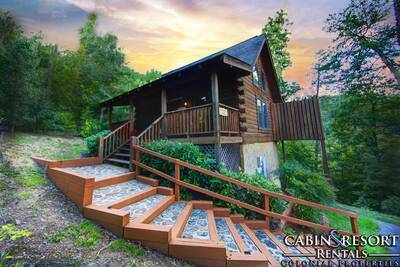 “ Great cabin, great view, great location, great price. We loved it and would stay again anytime. Can't wait for our next visit and the opportunity to use your discount for being loyal customers. With these qualities and prices we will always use Colonial for all our visits. 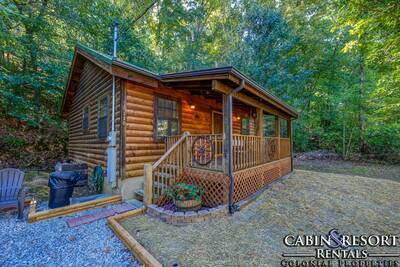 “ This cabin was well worth the price! We had a GREAT time in Pigeon Forge and Gatlinburg! Amazing views from the cabin! “ The hot tub was very relaxing after long days of hiking in the Park. The view was peaceful. The upstairs tub was also very relaxing. 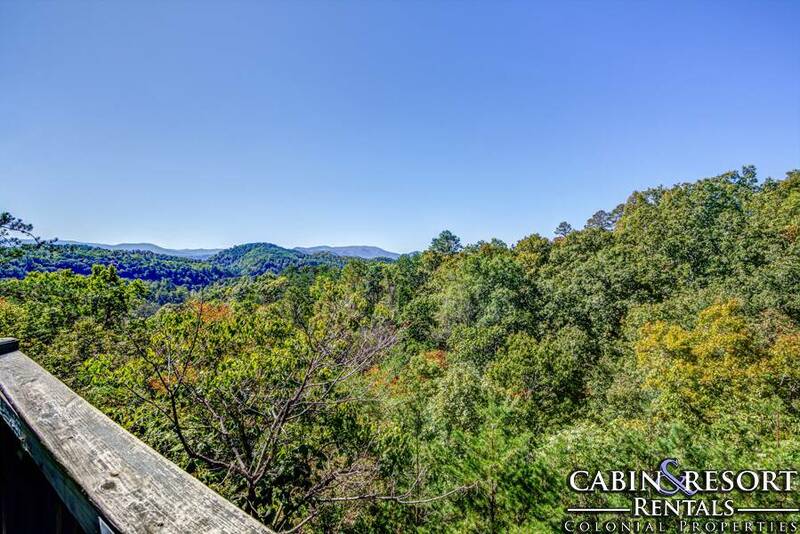 “ The Cabin we stayed at is on top of the mountain but is not really hard to drive to get here, It is really cleaned and secluded yet it is near the downtown. 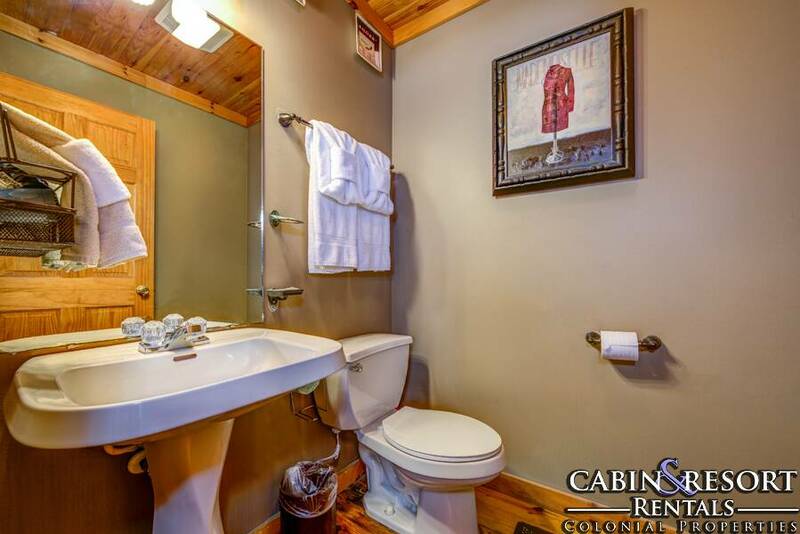 “ The cabin was outstanding. Very clean and nicely decorated. It was close to everything, a perfect location. It was a cabin my wife and I would love to visit again. We really enjoyed the time we were there and loved our stay. Can't wait to get back there for another weekend getaway!! 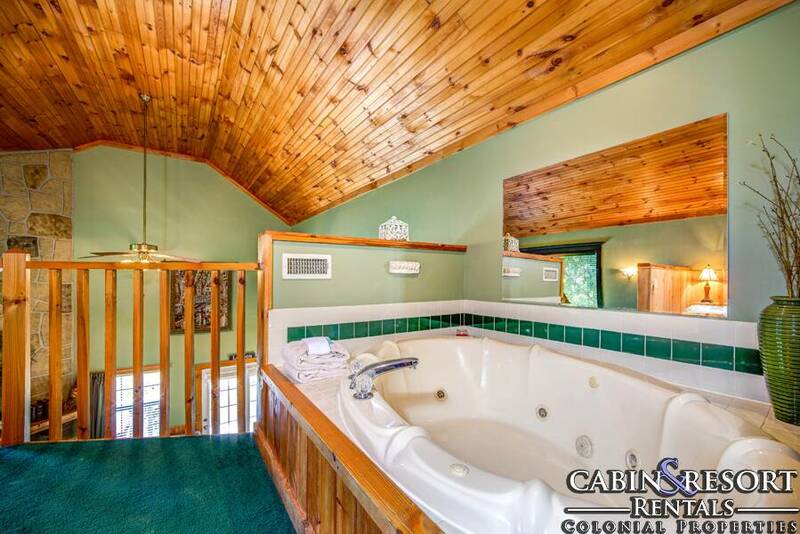 “ It was perfect, secluded, great jacuzzi and hot tub. Near to activities but felt far away! “ The cabin was everything we hoped it would be. A great experience and definitely look forward to coming back. “ My boyfriend and I had a wonderful mini vacation at the Holiday Chalet! 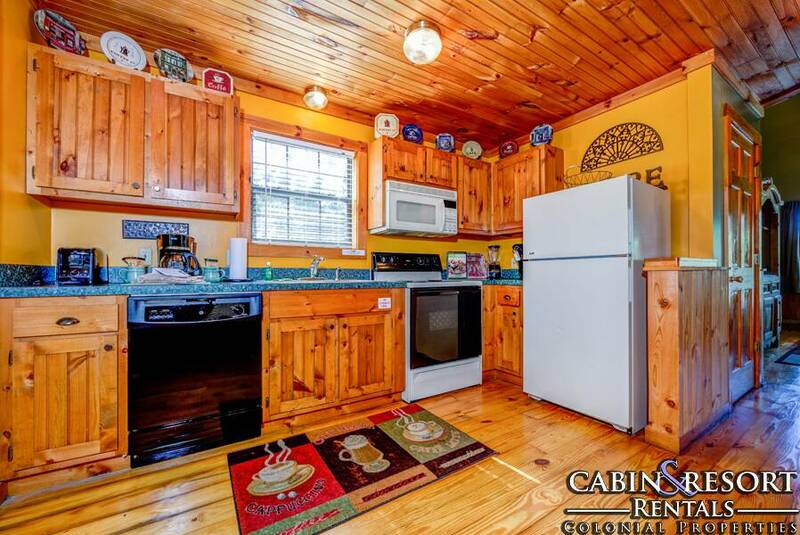 The cabin was clean and super adorable. There were other cabins nearby but the balcony still felt private. The views were fantastic and we loved sitting outside in the hot tub at night. 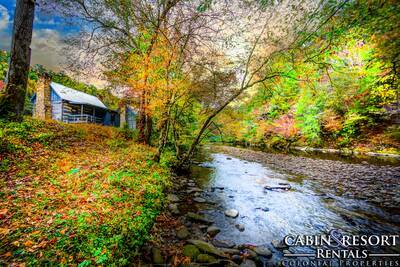 The cabin is a short drive from both Pigeon Forge and Gatlinburg. We will definitely be back soon! “ My wife and I planned a trip to Tennessee for our 31st anniversary. We stayed at the Holiday Chalet for a week in July. It was a very peaceful time in the mountains. The back porch had a good view of the Smokey Mountains. The sunrise and sunset times of day provided the best views. The cabin was nicely appointed but could use some closet space - we lived out of suitcases during our time there. The road to the cabin is one car wide. If you meet another car, one must turn into the nearest cabin's parking area to permit one vehicle to pass by another. During the summer, the vegetation infringes on the road. If you have a large vehicle, you will rub the brush on the road. The internet service was great, including the wireless service - no outages during our stay. This allowed us to stay in touch with family during our visit. We also had very good cell phone service. Overall, we had a great time. We hated to leave - our time there passed so quickly. This was our first Tennessee cabin rental. 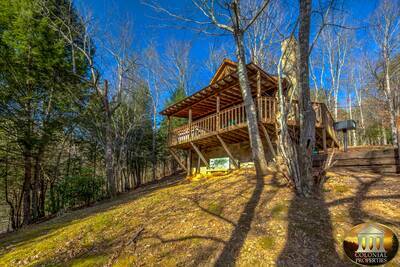 The next time we travel to the Smokies, we will definitely include a cabin as part of our plans. “ Our fifth consecutive Christmas stay in Pigeon Forge area. We liked Holiday Chalet best yet! We had stayed in it for a long weekend last fall, and immediately reserved it for our Chritsmas visit. This was our 3rd or 4th rental via Colonial, and have been satisfied each time. I recommend them to friends, but not my mother-in-law (because the staff at Colonial is way too nice to have to tolerate that woman). “ This was a great get away from the city of Atlanta. We had great views of the mountains from our porch. We will cone back to stay in these cabins again real soon. 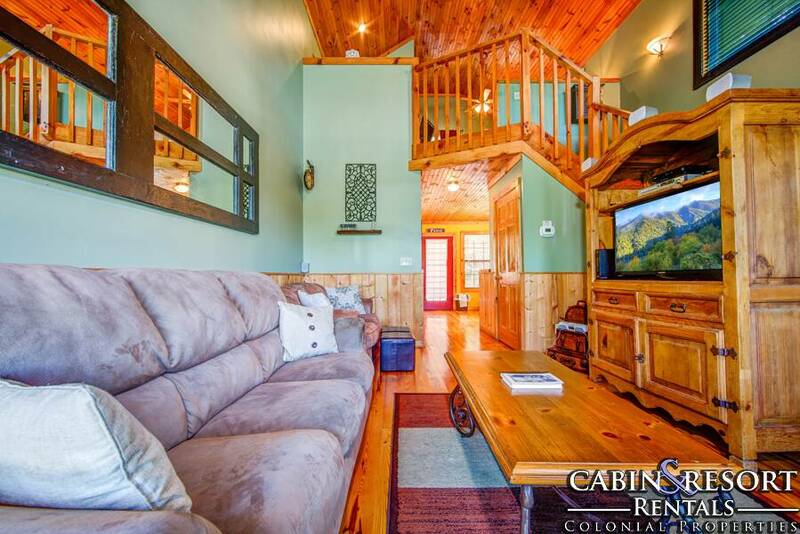 “ Over the past 5 years we have rented a variety of cabins in the area, using a total of five different rental agencies. 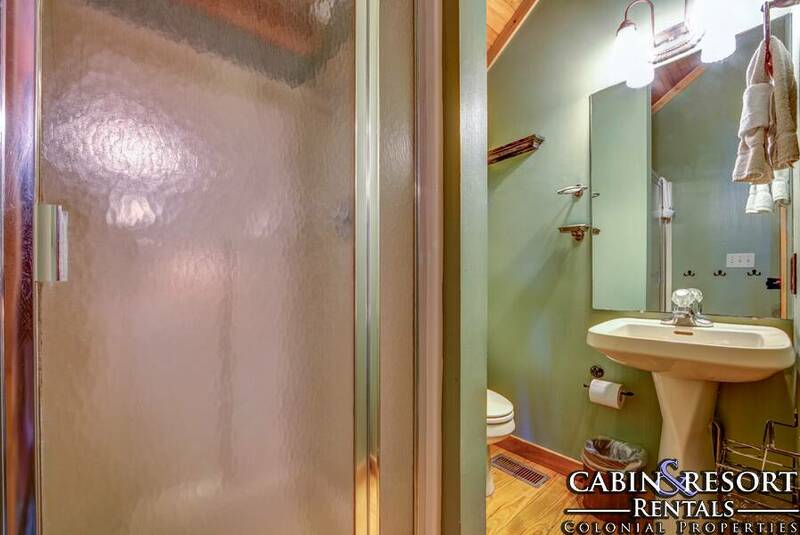 Holiday Chalet (and Colonial Properties Cabin & Resort Rentals) was the most pleasing to us. My wife loves the wonderful sofa and the huge TV. 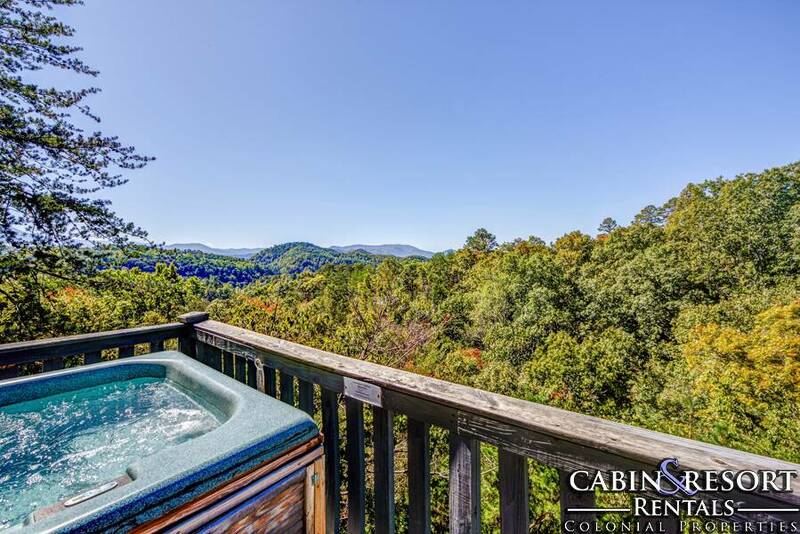 We enjoyed the view from the deck, and soaked in the hot tub enjoying that view. We had absolutely no complaints about this rental experience, and have no qualms about recommending Colonial to our friends and relatives. We had rented from Colonial previously, and noted that their already good check-in process had improved even more. “ We has a wonderful experience all 3 times we have used Colonial Properties. The staff are all very courteous and the cabins are clean. Very impressed! “ Experience was wonderful! So much so that we have decided to stick with Colonial Properties for our next trip! 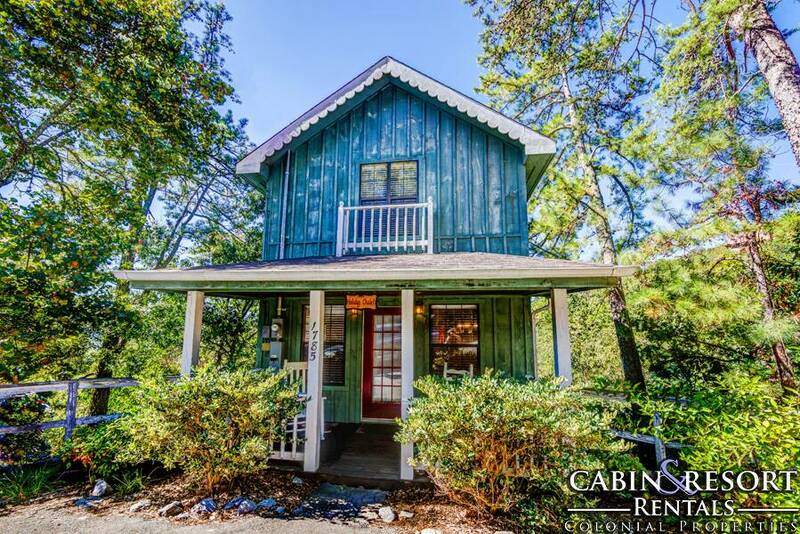 “ This is a beautiful little cabin for a family with maybe two small children or just a couple. We have two teenagers so it was a little small for us. We really did have a great time while we were there though. To cold to get in the hot tub but we did love the fireplace. 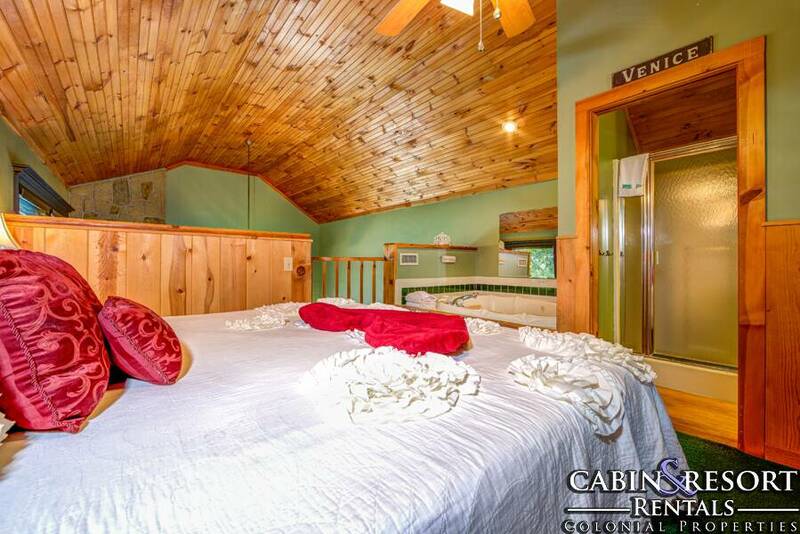 I would highly recommend this cabin for a wonderful stay. “ The Holiday Chalet was a home away from home. Decorated beautifully, cozy and inviting. Loved the hot tub and the view! 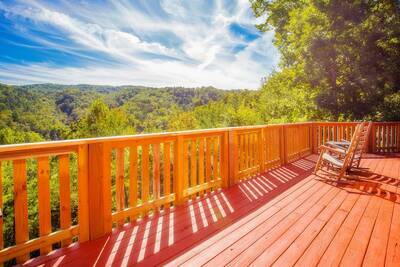 “ The Holiday Chalet is by far one of the most beautiful places to stay in Tennessee. It was far enough out in the country side to make one feel at peace, but less than 5 minutes from the hustle and bustle of Pigeon Forge. 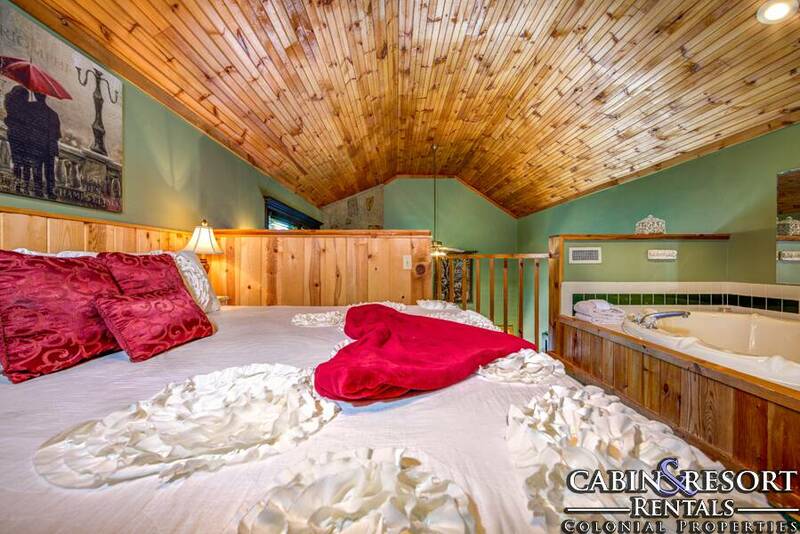 “ The Holiday Chalet was PERFECT for a romantic getaway for 2. 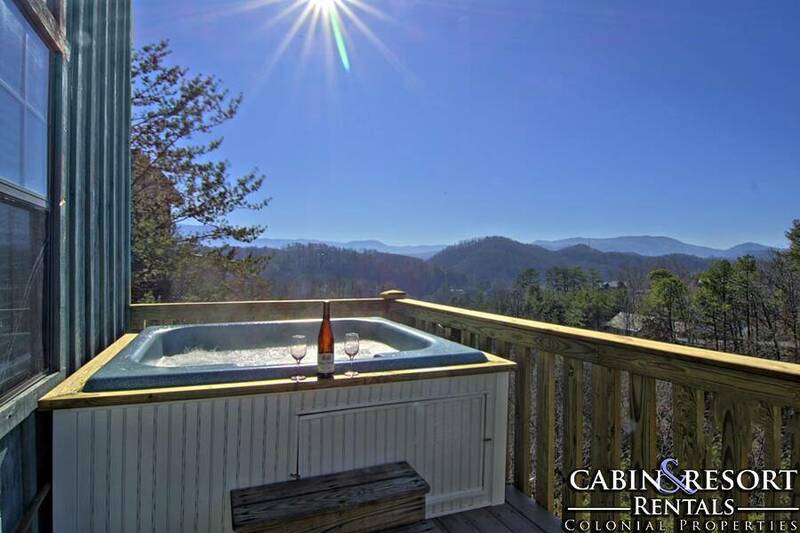 The balcony with hottub is very private and you can look up at the stars, no privacy fences needed.